GURGAON, India (24 May, 2018) — Taking forward the brand’s promise of providing progressive mobility and celebrating its fifth global anniversay in India, Datsun flagged off the third leg of ‘Datsun Experience Zone’ from Vertex Nissan in Gurgaon today. After two succcessful seasons in 2017, Datsun Experience Zone is back in 2018 with a more comprehensive coverage and experience. 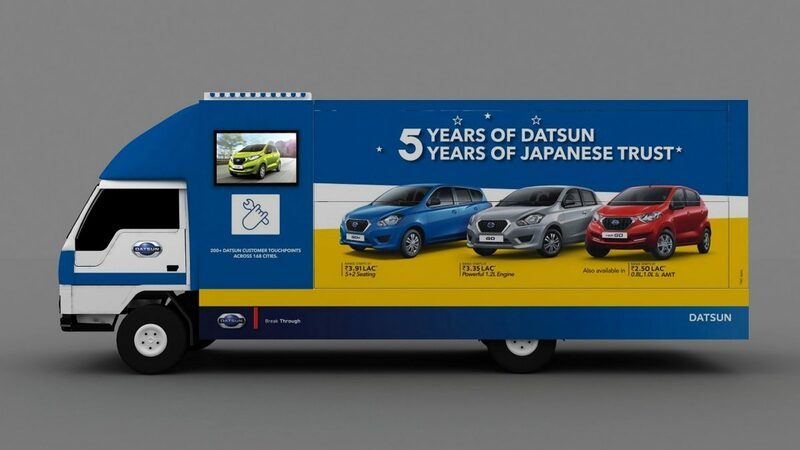 Starting today, twelve specially designed canters adorned with eye-catching livery that features 5th anniversary celebrations campaign will travel to 750 different locations including 160 districts and 300+ tehsils within a 50-100 km radius of Nissan/Datsun showrooms across India. Commenting on the launch, Peter Clissold, VP Marketing, Nissan Motor India Pvt. Ltd. said, "It has been our endeavour to provide progressive mobility to consumers in India. After two successful seasons in 2017, we are excited to kick off the third season where we aim to take the Datsun Experience Zone to 750 locations in the country. It is a testimony to our commitment to reach out to consumers in hinterlands and give them an experience of our brand promise through our products. We are looking forward to welcoming new customers to our family through this three months long promotion”. Nissan Motor Co., Ltd. announced the return of the Datsun brand, Nissan's third global brand, alongside Nissan and Infiniti, in March 2012. Datsun provides a sustainable motoring experience to optimistic up-and-coming customers in high growth markets. Datsun represents 80 years of accumulated Japanese car-making expertise and is an important part of Nissan's DNA. Datsun started sales in India, Indonesia, Russia and South Africa from 2014. For more information, visit www.datsun.com. Nissan Motor India Pvt Ltd.